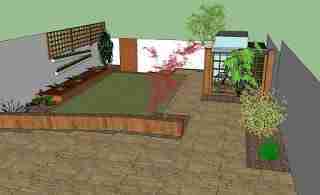 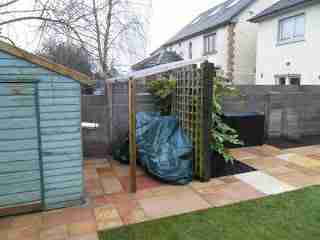 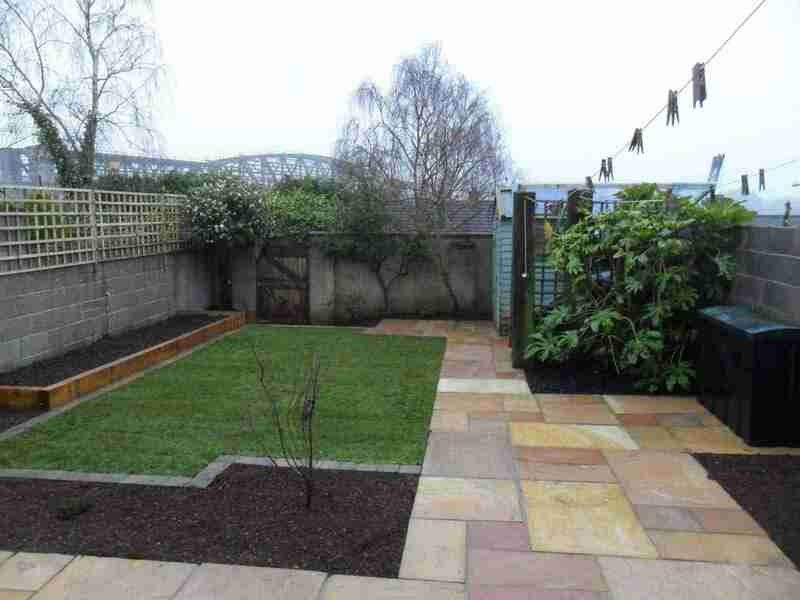 Contemporary styled garden with an Indian sandstone patio and path, sleeper edged raised beds and covered bicycle shelter. 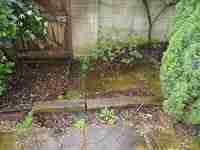 Slippery slope and poorly supported edging. 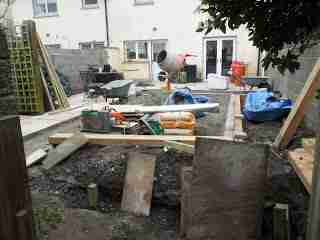 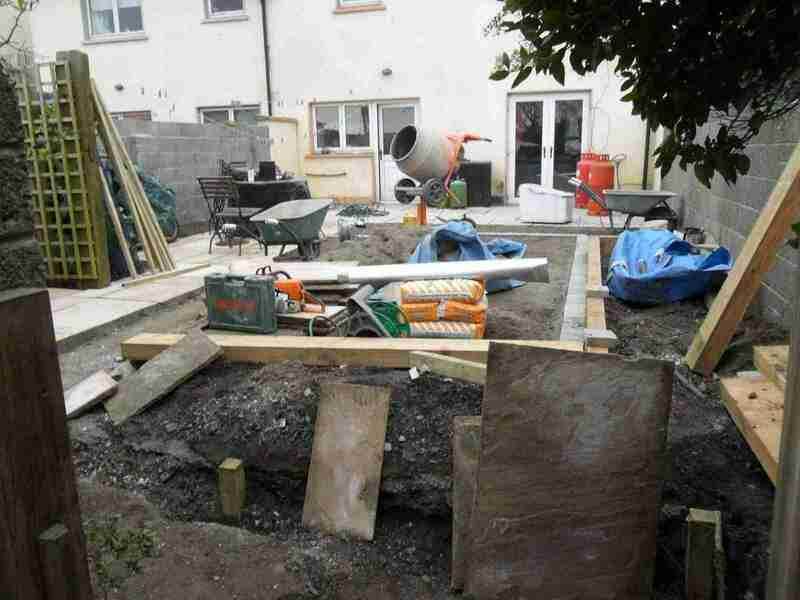 This garden in Drogheda co.Louth had been constructed some 8 – 10 years ago perhaps by a enthusiastic DIY er or poor tradesman.and had many issues. 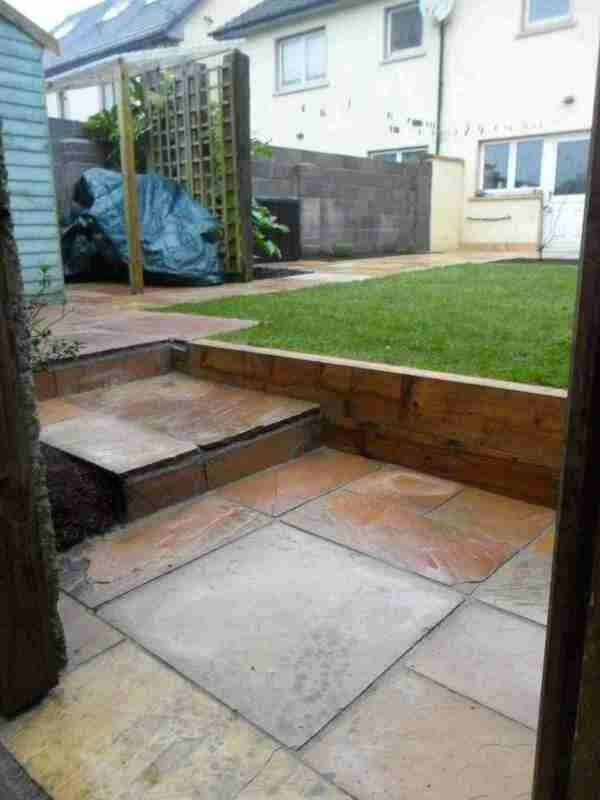 The area had been incorrectly paved with indian sandstone which had been laid upside down and uneven with un grouted joints. 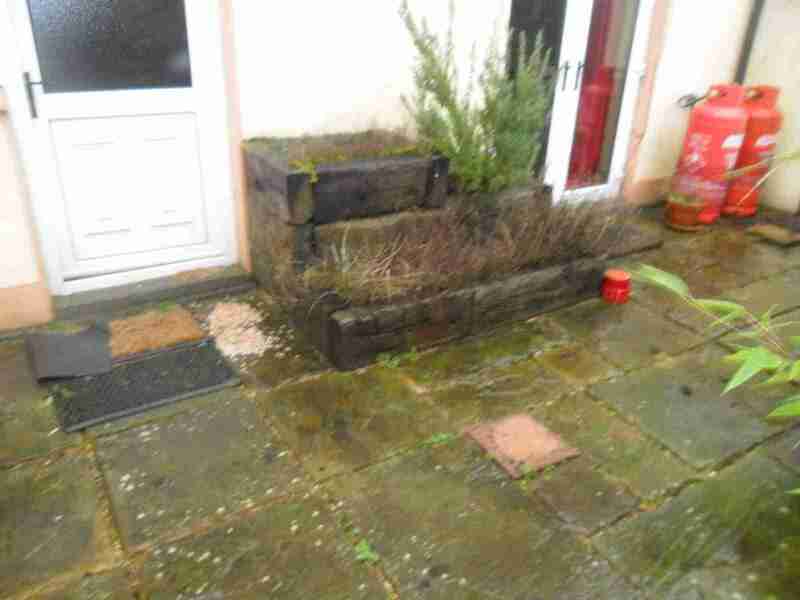 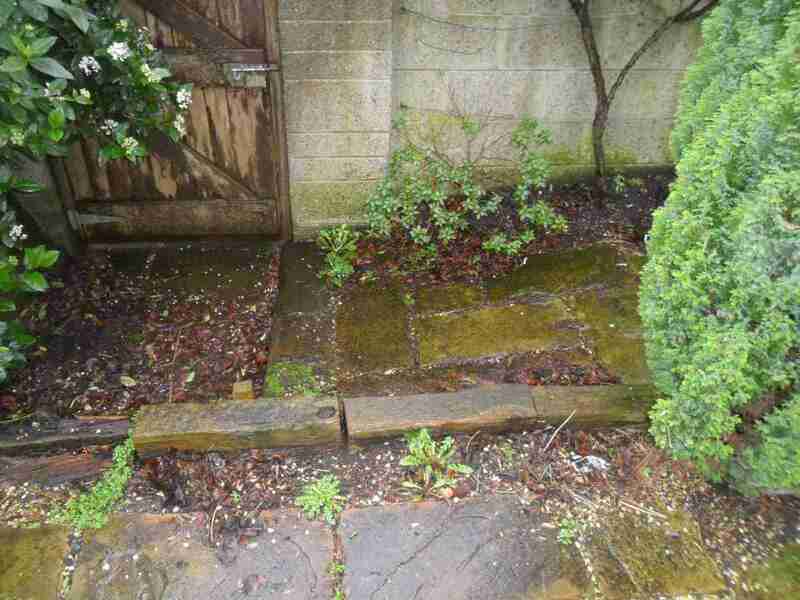 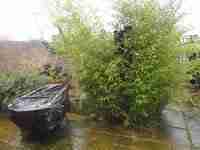 The result was a poor slippy and trip hazardous garden with weeds growing in the joints and algae on the slabs.Their access points to the inspection chambers and drains had also been covered over which meant that they couldn’t be accessed if there was a blockage. 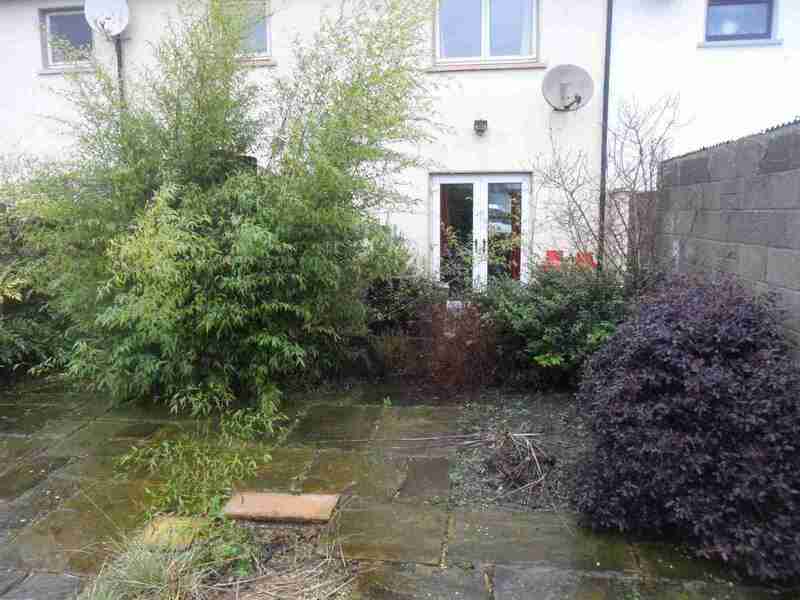 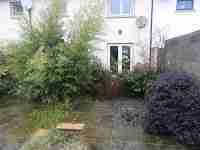 Its new owners were a young family who wanted to have a garden with a lawn area for their young child and an area which they could use themselves for outdoor living and growing some vegetables. 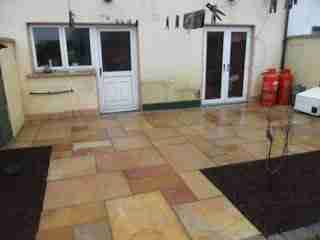 We decided that their best option was to have the slabs cleaned and relaid to correct falls as they weren’t in overall bad condition. New recessed covers for the inspection chamber were fitted with a linear channel drain laid against the house to protect the damp proof course. 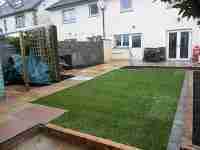 A new adequately sized lawn area with mowing edge was designed to balance the paving with raised sleeper beds for growing vegetables in. Trellis screening was fitted to raise the height of the low boundary wall and a bicycle shelter was constructed also to house their bicycles. 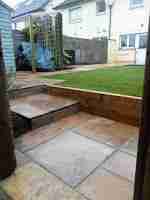 New open space for family to use. 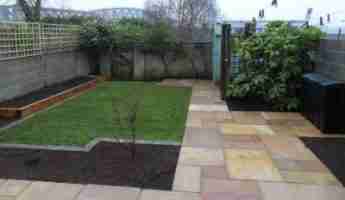 New beds with a Japanese Maple ,rosemary lavender and space to accommodate other kitchen herbs was allocated.We created a new retaining support wall for the lawn with sleepers and new steps leading to the rear garden gate.Our clients were delighted with their new garden.